Flaming Bess is not your typical band. The original band was formed in 1969, in Düsseldorf. There was the usual club gigs, and personnel changes, before finally recording an album. It just took them ten years. This was 1979's "Tanz Der Götter." A highly regarded album, and very much influenced by other symphonic music of it's time. The second release, 1980's "Verlorene Welt," had a more rock-oriented approach, and featured Marlene Krükel on vocals. This would be the last recording from the band for 15 years. In 1995, they resurfaced with "Fata Morgana". Apparently, this was not just an attempt at recapturing past glory. They had kept up with changes in the music scene, and produced a progressive album to fit the times. Seemingly a pattern now, the next album was not recorded for another ten years. "Finestere Sonne / Black Sun" was released in 2005. 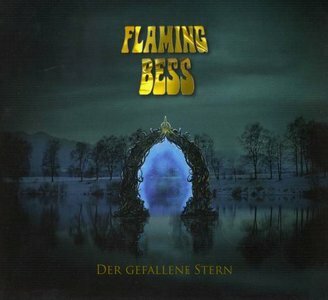 It is a double CD, with one in German and one in English. Though adversity, changing trends, and music industry woes, this band has kept going. They remain true to their vision, without becoming antiquated. A truly admirable group, that shows no signs of giving up (ever).